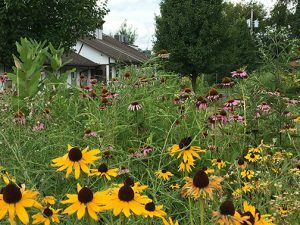 At Pittsburgh Mercy’s Glen Hazel Extended Acute Care (EAC) Facility, a mental health residential program for adults who need additional supports, hope and recovery are being experienced by combining traditional treatments with elements of the natural environment. Over the last five years, the EAC has supported a large garden so that residents and staff can join together to sow the seeds of hope and harvest the rewards of recovery. Black-eyed Susans (Rubeckia), purple coneflowers (Echinacea purpurea), and other perennials thrive in the wildflower garden. 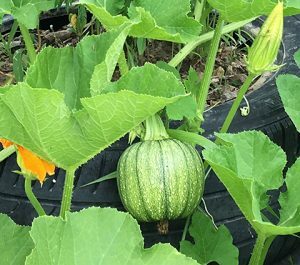 In our nearly three-quarter acre garden, we’re growing popular summer favorite fruits, such as watermelon and raspberries; hearty vegetables, including beans and pumpkins to take us into fall; and a variety of delicious herbs. We also planted a colorful wildflower field. 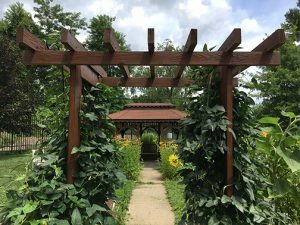 The garden has become an extension of the structured programming we offer in order to build hope and optimism – two key aspects in successful, evidence-based recovery outcomes. During their stays, which depending upon the needs of the individual can vary from a few weeks to 180 days, EAC residents have the opportunity to spend time engaged in, and making connections to, the natural world. The EAC offers year-round educational, nature-based activities to enhance both group and individual therapeutic sessions, and help link residents to their individual recovery goals. But many residents find that they experience much more. The garden space has enabled residents to reduce anxiety and stress. The natural setting facilitates improved awareness of their surroundings. Gardening helps them develop a sense of responsibility. The garden increases their skills of perseverance and determination. Gardening is a collaborative, communal activity in which residents and staff assist one another. In this way, the garden helps to foster socialization and communication while building a positive therapeutic rapport. Through shared responsibility and participation, residents report higher confidence and self-esteem and a newfound respect for nutrition and overall wellness. Thom Shaneyfelt checks the status of the cucumbers. One participant from the program spent most of his free time in the garden. He worked with his peers and staff on various tasks for a period of several months while also working on his recovery and toward his plan to return home. “I’ve been in the mental health system for years … but this is the first time that I’ve felt connected to my recovery,” reported the participant. 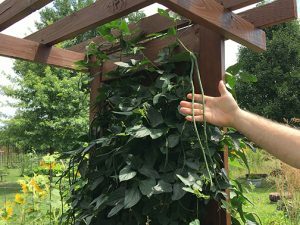 Another EAC resident recently experienced increased symptoms related to her illness, but found that the garden provided her with a natural foundation for her recovery. She started small, staying in the same area as others engaged in gardening activities. As her symptoms improved, she began to model the behaviors of her peers and soon offered to assist them. Staff also noticed her progress. She became more goal-oriented and was increasingly determined to take on more independent responsibilities. Later, when she was asked to what she attributed her improvement, the individual stated, “Doing things [in the garden] has given me something to focus on other than all my troubles.” She also later shared that the garden has given her a sense of purpose and the confidence to talk about things that were bothering her. 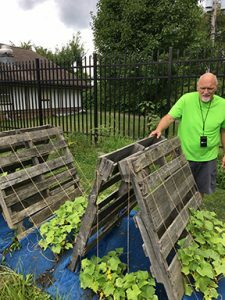 The garden at the EAC focuses on increasing success in recovery and has a significant impact on both the residents and staff who are involved in programming. The residents, staff, and program supervisors support the garden as a healing place. Every individual brings their own knowledge and skill set to enhance the nature-based programming at the site. It has been the communal experiences provided by the garden setting that have given all participants – no matter their level of engagement – significant benefits. The Glen Hazel EAC garden is truly a community effort – one that plants seeds and grows hope for most everyone. Thom Shaneyfelt, M.Ed., is a non-licensed clinician at Pittsburgh Mercy’s Glen Hazel Extended Acute Care (EAC) Facility. He is frequently found working in the garden. Photos contributed by Benjamin P. Bishop, MSW, LSW, supervisor at the EAC. *Editor’s note: The participants in this story asked us not to use their names. We honor their wishes and support them in their individual journeys to recovery. Pittsburgh Mercy needs your help to continue to offer this and other vital, innovative services to our community. Please consider making a monetary donation in support of our ministries or donating new seeds or gently used gardening supplies to our therapeutic gardening program. To learn more about ways you can give, please visit our Give page or contact our Development Office at 724-934-3537.